With more than 80 years of experience, our award-winning attorneys are committed to helping victims of carbon monoxide poisoning in recreational vehicles (RV). Of course, it is always a good idea to use a carbon monoxide detector in recreational vehicles, but in Tennessee it is also the law pursuant to T.C.A. 55-9-218. Any recreational vehicle that is leased or rented must be equipped with a properly functioning carbon monoxide detector. In addition, the rental or lease agreement must contain the following language: (1) the carbon monoxide detector was tested and found to be in good working condition and (2) a demonstration of the use of such equipment was performed for the renter or lessee (3) an acknowledgement by both parties to the agreement that the RV was supplied with a working carbon monoxide detector. If you or your family rents or leases a RV, be sure this language is included in the rental or lease agreement. But more importantly, make the lessor or owner demonstrate the use of the carbon monoxide detector as required by the law. This will ensure (a) it is working properly; (b) you are familiar with the alarms and function of the carbon monoxide detector. Regularly inspect your recreational vehicle's chassis and generator exhaust system. Make sure the floor, sidewalls, windows, door seals and weather strips are sealed properly. When parking, inspect your surroundings to ensure there is nothing that might prevent your exhaust from working properly such as a building, snow banks, another vehicle, bushes, etc. Do not sleep with the generator running. Even if it is hot or cold outside, leave a roof vent open anytime the generator is running. 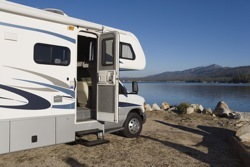 Inspect your RV to determine if the built-in vacuum cleaner exhausts underneath your vehicle. If it does, contact your dealer for an appropriate modification. Ensure all appliances within the RV are working properly and are well-vented. Do not use the range burners or the oven to heat the RV, even for a short period of time. Read and follow all directions and safety tips for gas-powered heaters. Each time you use your RV, test the carbon monoxide detector to ensure it is working properly. Know the symptoms of carbon monoxide poisoning and do not ignore them. Get fresh air immediately and seek prompt medical attention. If you or a loved one has been the victim of carbon monoxide poisoning, one of our skilled and aggressive attorneys will help you determine if you are entitled to compensation in a free, no-obligation consultation. If we think you have a case, we will work tirelessly to get you the compensation and the justice you deserve. We handle all our carbon monoxide poisoning cases on a contingency basis, so we only get paid if we recover money for you. Plus, we advance all case expenses so our clients are never out of pocket any money to pursue their rights. We have helped thousands of satisfied clients and we would like to help you too. From anywhere in Tennessee, call us at 615-742-4880 or toll-free at 866.812.8787 or contact us online.